One of the core values at WIKA is community involvement. That’s why employees from the Lawrenceville, Georgia, headquarters of WIKA USA volunteered to run – and steer – in the 9th Annual Bed Race, a fundraiser organized by Family Promise of Gwinnett County to end homelessness. It was mid-morning on a beautiful sunny Saturday, and Lisa Byard was in bed. Well, not just any bed, but one with four wheels, a steering mechanism, and two Bourdon tube pressure gauges with InSight dials as “headlights.” What’s more, she was getting ready to steer this bedmobile around the courtyard square in Lawrenceville, Georgia. 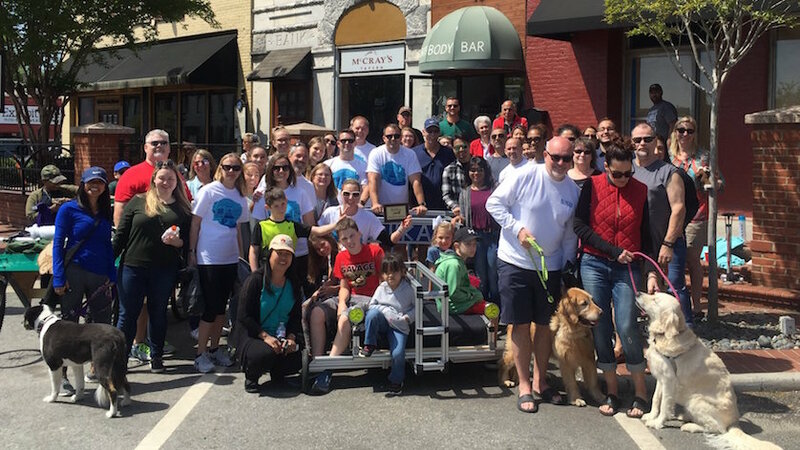 For the second year in a row, WIKA USA fielded a team for the Bed Race, a fundraiser organized by Family Promise of Gwinnett County to end homelessness. The company was a Gold Sponsor. 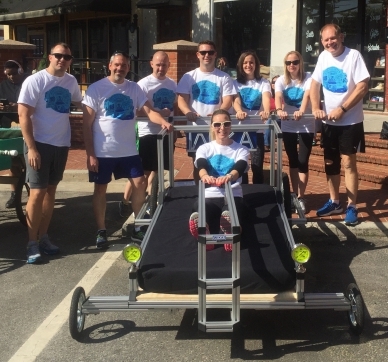 The Bed Race team members stand ready to push the WIKA USA bedmobile to the finish line. With the muscle power of Clifford, Williams, Dennis Knight, and Mat Brown behind her, Byard settled into the bed in preparation for the third and final heat. Beside the WIKA team was ViaSat, last year’s winner in the adult category. These two companies were competing for first and second place honors. Everything was going smoothly until after rounding the first corner, when a few spokes broke free from the wheel, which caused the back left tire to come off the axel. The runners quickly wedged the tire back in place and lifted that side of the bed so it was actually rolling on only three wheels. The team made it to the finish line. WIKA came in second place for speed, but everyone – including the county’s homeless families – walked away a winner. Family Promise will use the money it raised to provide housing assistance and employment solutions for local families. As for those nine WIKA employees, they were able to uphold WIKA’s core value of community involvement and have fun at the same time. The broken wheel from WIKA USA’s bedmobile serves as both a holder for the team’s second-place plaque and an inspiration to win next year’s race. 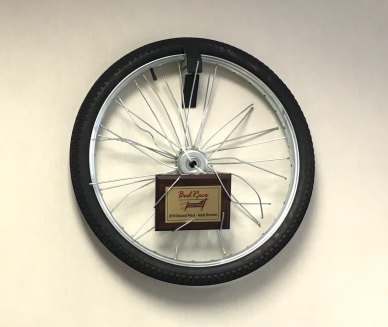 After the race, team members removed the broken wheel, nestled the second-place plaque among the bent spokes, and hung it on a wall in the human resources office. It serves as a daily reminder of WIKA’s commitment to community involvement – and as motivation to bring home first place next year!